Your satisfaction is our top priority. If you are not satisfied with your purchase, please return the item(s) for an exchange or refund within 30 days from the purchase date, unless otherwise noted on the product page. Ship the item(s) to The Writers Store via a traceable and insured method. You will be responsible for return shipping fees. Please include a completed Return Form with your shipment. Refunds take up to one week to process once we have received the item(s). Software returns must be deactivated and uninstalled from your computer before a refund may be issued. Please contact the software manufacturer if you need assistance uninstalling or deactivating your software. The following items are not returnable: Hollywood Creative Directories, DVDs (opened), and Gift Certificates. 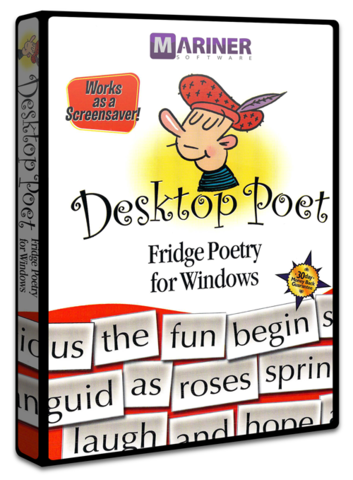 Desktop Poet turns your desktop into a “virtual fridge” area so that you can be as creative – and silly – as you want! Get those creative juices flowing, and discover your inner poet! Let your mind and imagination run wild! Whether, poet, novelist, playwright, educator, student or a person with a little time on your hands, Desktop Poet puts hundreds of words right at your fingertips. Move them around to create your poems, prose or to brainstorm. The tiles become a visual embodiment of the English language, freeing you to let your mind travel through uncharted territory. You can increase the available vocabulary and decrease the number of tiles. A single tile can have multiple word variations. Highlight the word, click escape and, for example, picture becomes: pictures, picturing, pictured. Need more? Set backgrounds, colors and more, making Desktop Poet a creative wonder world. Copyright © 1982 - 2019 The Writers Store ® Incorporated. All rights reserved.